Aimed at small to medium-sized offices, the Panasonic UF-4600 is a compact and speedy fax machine designed to help improve productivity while ensuring business-class quality output. The flatbed scanner makes it more versatile, while the ample paper capacity is enough to accomplish tasks in less time. 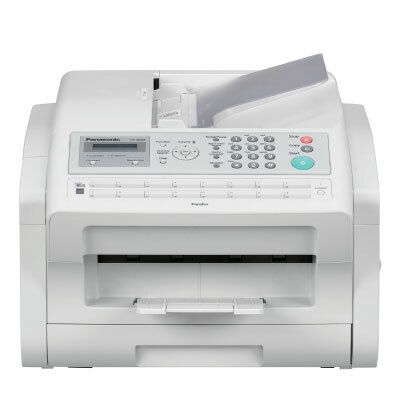 However, the Panasonic UF-4600 business-class fax machine and colour scanner doesn't support internet fax and LAN connectivity. Measuring 11.7 inches tall, 18 inches deep, and 16.5 inches wide, the Panasonic UF 4600 laser fax is an 11.5kg machine with an understated cube-shaped frame, a simplified control panel, and a 32-character monochrome LCD display screen. It has four megabytes of memory and capacity for 250 sheets. The UF4600 black and white laser fax machine includes a CCD colour flatbed scanner, with scan speeds of up to four seconds per page. The Panasonic UF-4600 business fax machine can produce up to 99 copies from the original and store 240 pages in the memory. Features like misdial prevention, junk fax filter, department codes, and fax access code make it more secure. Laser electrostatic print method ensures sharper and more accurate output. The Panasonic UF-4600 mono fax machine transmits messages fast, and the 30-sheet automatic document feeder can help users save time. Up to 200 entries can be saved in the auto-dial function. Users dont have to go over budget buying toner because genuine Panasonic UF4600 fax cartridges are very affordable. The paper capacity and RAM of the UF-4600 laser printer cannot be expanded. Security features lack job tracking and user authentication functions. The Panasonic UF-4600 facsimile lacks G3 support, internet fax, and scant-to-email feature. A network interface and a USB port are also missing.